Wat Syn is a 4-oscillator, modulatable wavetable synthesizer, another powerful instrument included in the Linux MultiMedia Studio (LMMS) Digital Audio Workstation. To open it, click the "Instrument plugins" tab (the first little box on the left side of the screen, below the Project menu selector) and drag the Watsyn icon over to the Song Editor section. Each of the four oscillators in WatSyn can be set to sine, saw, square, triangle, or drawable waveshape. These can also be phase shifted at 15-degree intervals. Wave A1 works in conjunction with Wave A2, and Wave B1 works in conjunction with Wave B2. There are four modulation arrangements: "Mix" which mixes the output of both waves 1 and 2; "AM," where wave 2 modulates amplitude of wave 1; "Ring," where the ring modulation feature modulates waves 1 and 2; and "PM," where wave 2 modulates the phase of wave 1. Each oscillator can be independently adjusted for volume, panning, coarse- and fine-tuning (fine-tuning for both stereo channels), phase offset and stereo phase detuning. The large A-B Mix knobs adjusts the balance between waves A1-A2 and waves B1-B2. The other pages of WatSyn reveal a similar set-up to that of Triple Oscillator. It is polyphonic, there are arpeggiator and chord functions, LFO parameters, and the traditional ADSR for amplitude, cutoff and resonance. There is also an effects chain section for plug-in effects to be added. 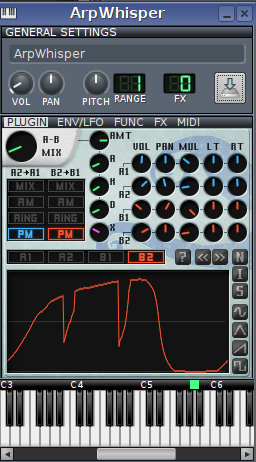 To make presets, click the floppy-disk icon, give your new patch a name and save. The next time you load LMMS, you will see your new patch in the "My Presets" list on the left side of LMMS. Drag the sound from the list into the synth and it will load. Watsyn-01 A few presets for starters. Unzip the compressed file into your ~/lmms/presets/Watsyn directory and they will appear when you start LMMS.